She was the first to earn a medal! The Quest is a reality competition show set in the fantasy world setting of Everealm. Twelve Paladins must endure training to find the one true hero and defeat the enemy, Verlox. One of those Paladins is Bonnie – with her first snort laugh she had the fan base falling in love with her! I had the chance to talk with her about her friendship with Patrick and how she feels being the fan favorite! 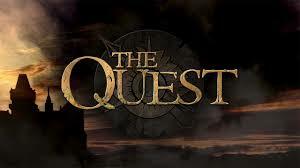 The Quest airs on ABC Thursday from 8 – 10 pm ET. This upcoming Thursday, September 11, is the finale with back-to-back episodes. A thank you to @Session_Diva for the pictures! Bonnie Gordon can be found @BonnieBellG or on her website at bonnieballgordon.net. Tina Degenhart: How did you find out about The Quest and how did your audition process go? Bonnie Gordon: I saw an ad for The Quest on theonering.net. Though it seemed perfect for me, I hesitated to go for it, since the idea of reality TV didn’t appeal to me – the backstabbing and cutthroat aspect of reality TV… I’m not a fan. But a friend of mine REALLY wanted to go for it on his birthday, so we got a small group together and all went to support him. My friends ended up being cut and I got kept. I’m sure he’s still a bit mad about that! Haha! The entire process took a few months! They kept narrowing it down. Once it got towards the very end of casting and I learned more about what the show would entail, I wanted it even more! The little nerd girl inside of me was jumping up and down with the possibility of living in a fantasy world! Bonnie is always supportive of her Paladin family. TD: The term ‘fan favorite’ gets thrown around a lot when your name is mentioned, how does it feel? BG: Wow. I’m still in shock, to be honest! The love and support from the fans has been so overwhelming! I still can’t get used to using the words ‘fans’ … especially since through the live tweeting and Facebook, I’ve gotten to know so many of The Quest Army personally. Instead of fans, I like to consider you guys my friends and fellow nerds! We’re all just geeking out over the same show – I’m just lucky enough to have gotten to experience the show on a different level. TD: Did you ever imagine you and Patrick getting so close? I guess it was the Fates doing that you guys were stuck sleeping in the same room! BG: From the very first moment all the Paladins arrived in Everealm and were on the raft through the caverns, I could tell Patrick and I would become friends. I felt a connection with all the paladins,they were all such incredible people! – but as soon as I met Patrick, we clicked right away. They don’t show this in the first episode, but that moment when the sun rises and we see the Castle for the very first time – and then start running through the field – I started falling way behind the others. I was embarrassed that I couldn’t keep up with the other paladins. TD: All of the ladies’ hair always looks so beautiful! I’m even trying to recreate a few of your styles; who did the hair and makeup? BG: We did all our own hair and makeup! Although, pretty much everything was taken from us when we arrived in Everealm, (our phones, our clothes, etc. ), they allowed us to keep hygienic things such as our toothbrushes, deodorant, etc. This included brushes and some basic makeup for the girls. We all had to share one small mirror in the castle – it was hard when we had so many girls trying to use it at the same time! I’m awful with eye makeup so there was a few times that Leticia would help me, since she’s really good at it! TD: How was it spending all of that time in the castle? BG: It was incredible! At first it was rough, since we had no real electricity, A/C, heat, toilets, etc…. but after a few days, it really became a second home to us. We would have some down time and hang out in the Commons Room. All the paladins would sing songs like Wild Rover and Here’s A Health To The Company. The best was when there were thunderstorms in Austria. We would be stuck in the Castle in the dark, with the thunder and lightning outside the windows. The thunder would shake the whole Castle. It felt magical! TD: Can you think of a moment where you found yourself almost losing touch with reality and accepting Everealm as your new reality? BG: I think we all did… At first it was off-putting seeing the cameras, but after a day or two you honestly forgot they were there. We would get so wrapped up in the story! The actors had a big part in that… they would stay in character, even with no cameras around. It made it that much more real for us. We would try our best to get the actors to break, but they stayed true to their characters till the end! TD: We’ve only experienced two but how many songs did you write and sing during The Quest? BG: Oh wow… I wrote quiet a few! Of course there was The Ballad of Everealm, and Sir Ansgar the Fierce. After Sir Ansgar humilated Crio in the courtyard, calling him a coward, I wrote a nice song for Crio called Crio the Brave. I wrote one that was more like a jingle, naming all the kingdoms so I could remember the names of the kingdoms of Everealm. There was one that was more of a joke for the paladins called, “In A Castle” to the tune of “That’s Amore!” I remember the last line of the song (where the words “Scuzza me, but you see, back in Old Napoli. That’s amore!” would go) were “And we all have to poo, cause we can’t do Number Two, In a Castle!! !” Sorry if that’s too much detail! Adria and I also rewrote the words to the chorus of Health To The Company to fit the paladins and The Quest. Bonnie is relieved the Queen is okay! TD: The Quest has so many amazing moments; Peter mentions that you singing Sir Ansgar the Fierce was his! Do you have a favorite moment that may or may not have made it onto the show? BG: For me, (and I think I speak for most of the paladins), it was singing Wild Rover all around the Commons Room table. It became our nightly tradition. I know someone somewhere has footage of it! Maybe if ABC releases some special features or cut scenes, they can include that. I know all of us would want a copy of it! TD: Finally is there anything that you wish someone would ask you or something you would like to add?